Save your favorite homes for sale. Get alerts the moment a property hits the market or if the price changes. Don't miss that dream home! Complete luxury with top of the line designer finishes throughout this newly remodeled PRIVATE estate on 10+ level acres. This lovely ranch home resides within the community of Rancho Mirage, previously a 220 acre ranch. Wood floors, locally quarried granite countertops, art niches and wonderful eclectic touches throughout. 12' and 10' ceilings that include details with lit coffered areas and beetle kill wood inserts. Gourmet kitchen and great entertaining spaces inside and out. Radiant in floor heat and plenty of storage. Lovely level acreage allows room and water for horses. Beautiful landscaping and the perfect flow for entertaining. 25 minutes to Denver and perfect back route escape to ski resorts. Great Jeffco schools. View virtual tour for more extensive photos. 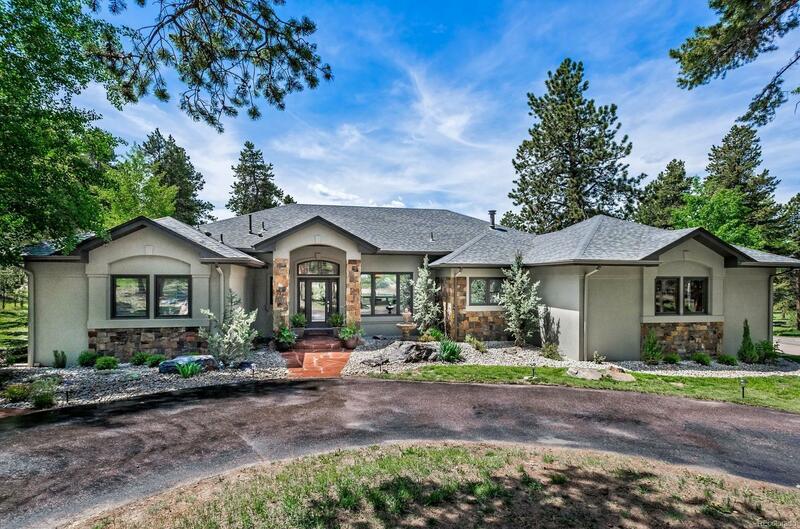 The content relating to real estate for sale in this Web site comes in part from the Internet Data eXchange ("IDX") program of METROLIST, INC.DBA RECOLORADO® Real estate listings held by brokers other than Orson Hill Realty are marked with the IDX Logo. This information is being provided for the consumers' personal, non-commercial use and may not be used for any other purpose. All information subject to change and should be independently verified.